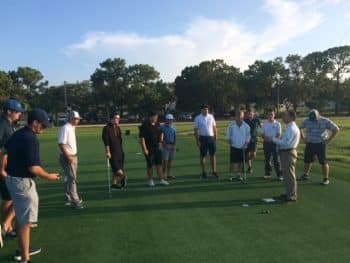 Keiser University’s College of Golf (COG) History of Golf class students recently had the unique opportunity to participate in a putting competition using hickory-shafted putters and golf balls from different historical eras, beginning in the early 1800’s and progressing through modern day. 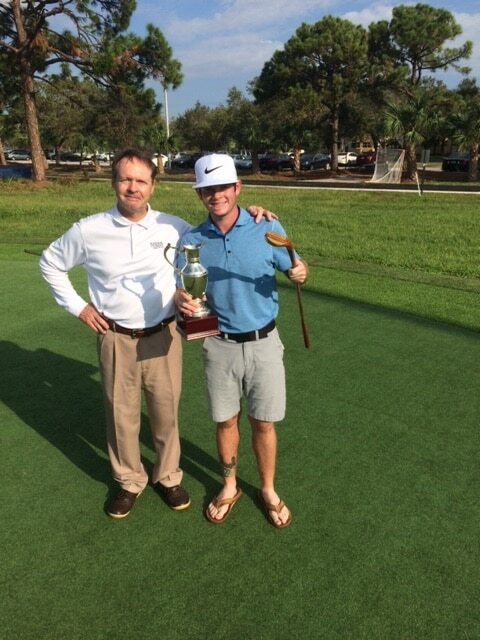 Par for the course was 36, and the second Champion Putter of the Historic Open Putting Championship was student Jay Jay Howard, who tied Christian Brown for first place with a score of 37 and won a three-hole aggregate playoff with a score of even par. 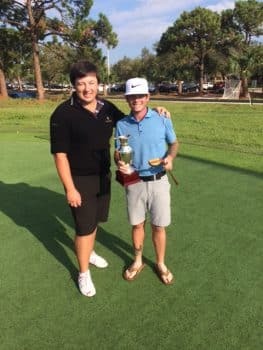 Finishing third by a single stroke were students Brennan Gillis and Robert Stingo. The remainder of the field results follow: Jonathan Gosbee (39), James O’Hara (39), Tom Brady (41), Ed Dougherty (41), Dima Koba (42), Winston Crosier (44), and David Geers (47). Seventeen holes-in-one were recorded, a record number for the event, with Jonathan Gosbee claiming four during his round. Future History of Golf class students will continue to enjoy the competition, and they too will have their plaques added to the base of the Open Claret Jug replica to commemorate their victories.